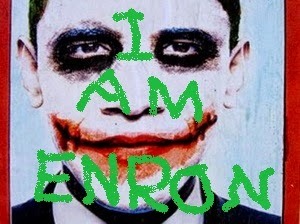 The Stark Raving Viking: Obama, the spawn of Enron? Politicians can start out not being able to pay their college loans, and then while still in office, they are worth 100's of millions of dollars. How does that magic trick happen? Bankers and corporate heads can steal 100's of millions of dollars, maybe even trillions, and make huge salaries, bonuses, and get bailouts. Taxpayers pay for criminal activity and fraud. The biggest criminals who are billionaires buy the next round of politicians. We then have to pay for derivatives and their fraud. Obama is in the last chair of the biggest Ponzi Scheme when the music has stopped. In 2001, those who were stealing trillions for the Pentagon and those in the private sector who were equally afraid of prosecutions and giving back all that they stole needed the biggest mass distraction possible. Without the event there would have been prosecutions, honest accounting, and settling back to more honest private and public sectors. The Ponzi Scheme only expanded. The Enron plan lives. The Obama Regime is following the bait and switch scheme to a "T". Pump and dump. Go after detractors. Rig the courts, and buy off, eliminate, terrorize, and/or kill witnesses. Rig the system for the billionaires. Make the people pay for their own enslavement and abuse. The can has been kicked down the road as far as it can go. 99% of the world's public has been ripped off to the maximum possible amount. The biggest criminals in the history of the world are asking their victims to pay back (reward) the criminals for their crimes. We need to pay back all the money and property stolen from us to those who stole from us. We are signed on to the biggest debts in the history of the world. Those who stole from us can seize all assets, cash, accounts, property, future earnings, and even our lives for the debts they claim we owe them. This all makes sense to you, right? Well, if not say, "Hi", to the police as they ride by in their wheeled tanks protecting bankers and their criminal politician friends. All hail the New World Government. I watched "Enron: The Smartest Guys in the Room" today on Netflix. Watch the entire movie in full quality. If you can understand the older sloppier plan, you can understand the equally sloppy, but bigger, plan that continues. James Corbett of the [Corbett Report] exposes government run by fraud and lies.